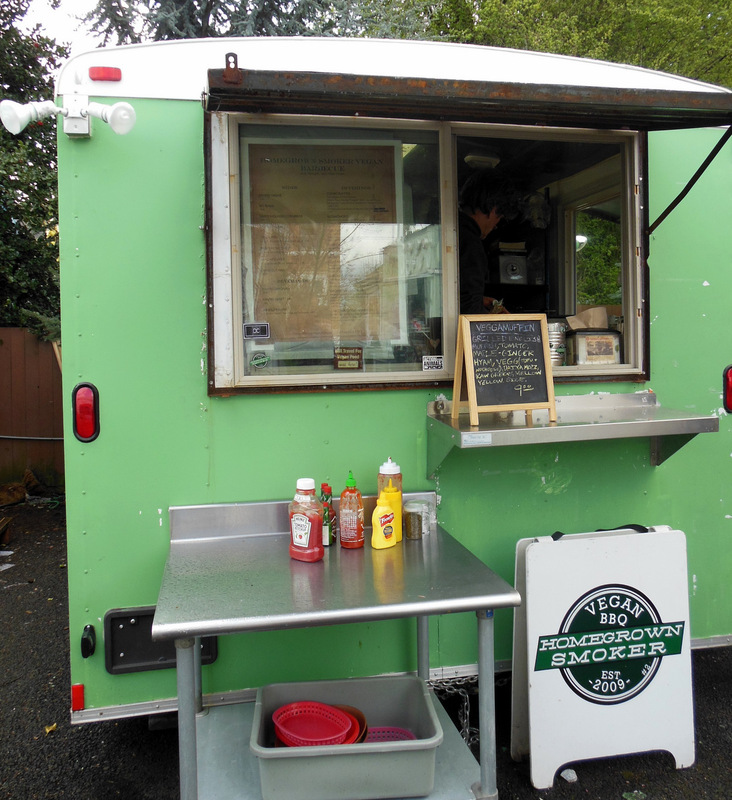 Homegrown Smoker Vegan BBQ Cart – Portlandia Lives! 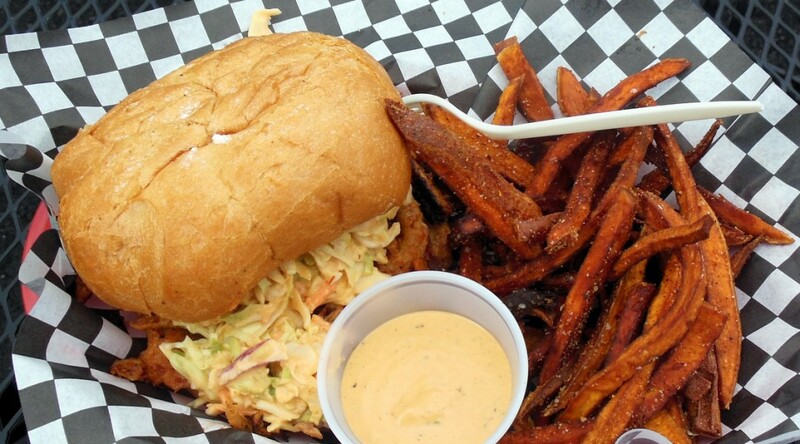 The concept is straight out of Portlandia – vegan BBQ. How is it not an oxymoron? The very definition of bbq is roasting meat, and in some quarters it has to be pork. I found this out in the first several chapters of the book Cooking by Michael Pollan. But the Homegrown Smoker Vegan BBQ food cart produces smoky vegan bbq offerings. 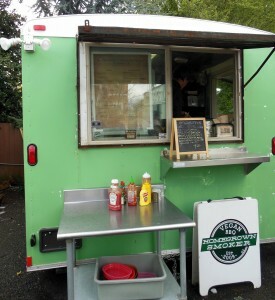 Its current location is at the Mississippi Marketplace cart pod in North Portland and is open 7 days per week. My tease to try them was via Chris Angelus’s Right at the Fork podcast. He interviewed the owner/chef Jeff Ridabock in episode 12. I was impressed by Jeff’s passion for vegan food and infusing bbq smoky goodness into non-meat items. It was a diametrically opposite swing from my visit to the Cultured Caveman paleo food cart the day before. But not really, as both aim to use natural ingredients to produce healthy food. 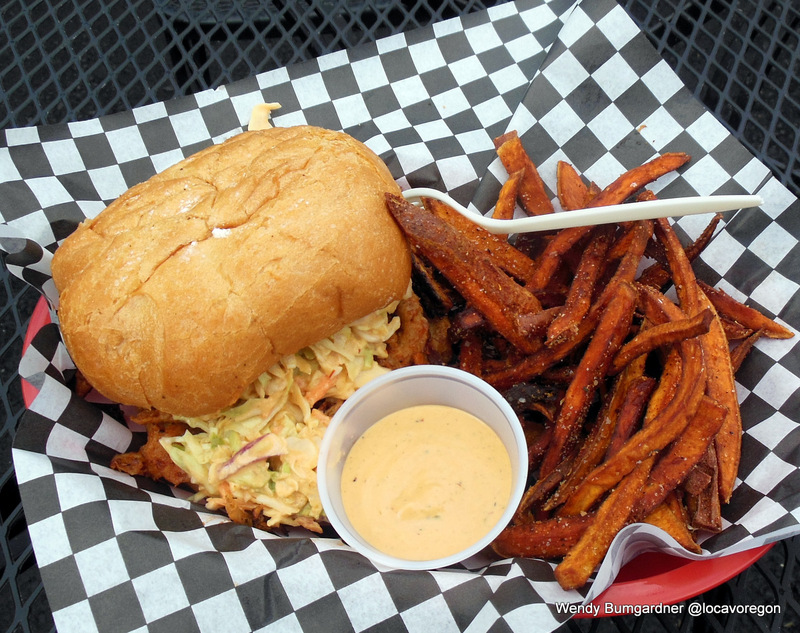 Their much-lauded sandwich, the SloSmoMoFo, is featured in the March, 2014 Sandwich Smackdown contest on Portland Monthly. I had to give that a try, as it has smoked soy curls standing-in for pulled pork. I love pulled pork sandwiches. The cart pod was hopping at 12:30 on Sunday. Jeff Ridabock was taking orders and I was surprised to discover the $8 for the sandwich included a side (and I chose sweet potato fries). With a couple orders ahead of me, it wasn’t a long wait. The sandwich was hefty — on a big bun, with a generous amount of cole slaw on top. But it wasn’t particularly sloppy (although the fork was welcome). I’ve never had the soy curls, which probably need a better name. That name makes me think of squeaky cheese curds (maybe it’s just me?) Instead, they are not rubbery and do a pretty good job imitating the texture of pulled pork. Ridabock had definitely given them a true smokiness that didn’t come from sauce. They were seasoned to be a bit spicy. The whole sandwich was tasty with each bite. It was very satisfying and filling. Meanwhile, I also loved the sweet potato fries with chipotle dipping sauce. They were nicely salted and yummy. I would definitely stop in here again for this combo.